The Labyrinthine Journey is now available to buy. Follow Evan as he continues his odyssey as Servant of the Gods in The Labyrinthine Journey. The quest to locate the sacred object adds pressure to the uneasy alliance between Evan and the Atlanteans. His inability to accept the world he’s in, and his constant battle with Zeus, both threaten to derail the expedition and his life. Traversing the mountainous terrain of the Peloponnese and Corinthian Gulf to the centre of the spiritual world, Evan meets with Pythia, Oracle of Delphi. Her cryptic prophecy reveals much more than he expected; something that changes his concept of the ancient world and his former way of life. Will Evan and his friends succeed in their quest to find the relics and stop the advent of Christianity? 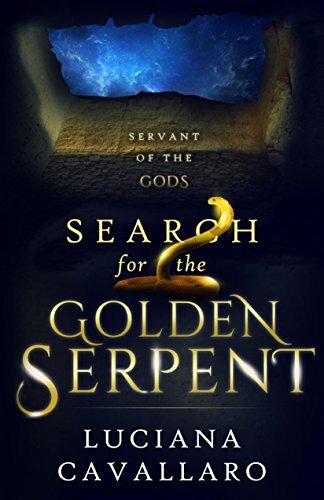 Historical fiction novelist and a secondary teacher, Luciana Cavallaro, likes to meander between contemporary life to the realms of mythology and history. Luciana has always been interested in Mythology and Ancient History but her passion wasn’t realised until seeing the Colosseum and the Roman Forum. From then on, she was inspired to write Historical Fantasy. She has spent many lessons promoting literature and the merits of ancient history. Today, you will still find Luciana in the classroom, teaching ancient history and promoting literature. To keep up-to-date with her ramblings, ahem, that is meaningful discourse, subscribe to her mailing list at http://www.luccav.com.